At the beginning let me tell you a few things about us. 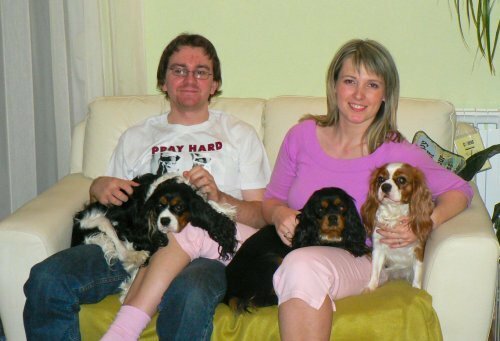 My name is Vlatka and this is my family: my hubbie Neven, daughter Laura, Cavaliers Queenie, Ruby and Funny, rabbits Grga and Irina and lots of fish in two tanks. We all live in a beautiful peaceful place near Samobor city. 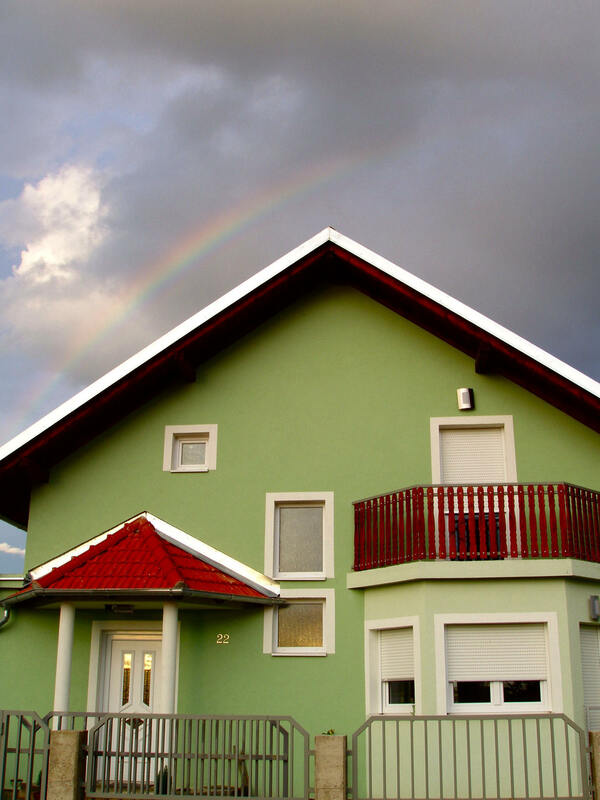 My hubbie and I were typical "urban children" who grew up in capitol city of Croatia – Zagreb and never dreamt that one day we'll escape from city crowd and build our home in Strmec Samoborski. I must say that our friends were skeptic when we decided to build a house 16km away from Zagreb instead of buying an apartment in Zagreb. In the end it turned out to be a good choice and now we can't think of any place where we would rather live! We all gained lots of benefits: peaceful neighborhood, freedom, our children will have more space to play and chance to grow up surrounded with animals, and our Cavaliers have a yard to run around and their own room with bath tub and exit to back yard. Story begins approximately ten years ago when I saw a photo of a tricolour Cavalier in some fashion magazine. It was love at first sight and at that moment I decided that I would have a Cavalier some day. But, as I was still in high school at that time, I knew that this dream will not come true until I sign in the University of Electrical Engineering and finish successfully. That was my plan. Years went by and I filled my hard disk with materials (mostly photos), that had anything to do with Cavaliers, which I gathered over the Internet. I sent hundreds of e-mails to breeders all around the world, went to dog shows so I could see and cuddle a few Cavaliers. Every day I was one step closer to my dream come true and at the same time it felt like eternity. And then one day, totally accidentally (or was it God's finger? 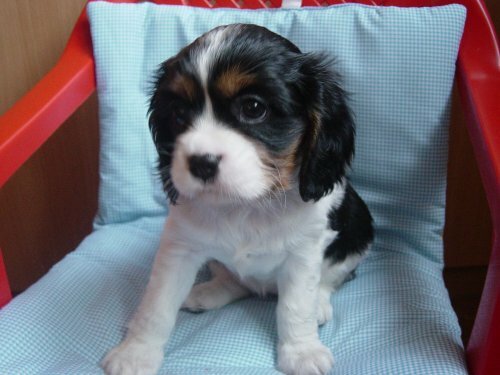 ), I saw a topic about Cavalier puppies on my favorite forum (pet forum). I instantly called my hubbie (he was my fiancé at that time) and next day we went "only to see" the pups. Of course it didn't end there as one tricolour girl instantly stole my heart. My significant half then decided to give me the best present for my diploma – a Cavalier!!!! We named her Queenie and that's exactly what she was – the queen of our hearts. As Queenie was only a month old when we first saw her, we had to be patient for a while till we'll be able to bring her home with us. To shorten that time of inpatient waiting, I went to the breeder (Andrea Mihaljević) every week to cuddle my little queen and to talk about Cavaliers. During those meetings Andrea and I became closer and a friendship was born. Day we brought Queenie home was one of the happiest days of my life, one that I will never forget. A desire to breed and try to improve this beautiful breed came spontaneously. At a period of time when we were suppose to move into our house another Cavalier came into our family (from the same breeder, Andrea) – a beautiful blenheim girl "Ruby" and our Queenie got companion! Not long after that Neno (my significant half) and I decided to travel to Northern Ireland to visit one of the world famous kennel "Moorfields Cavaliers" with whom I e-mailed for the past two years. 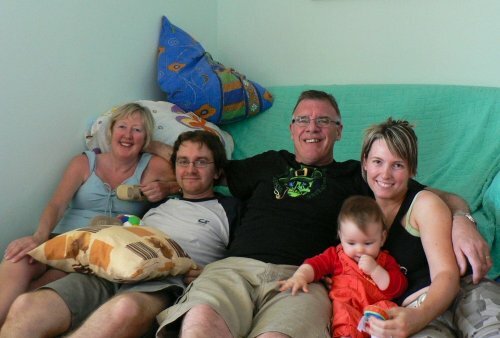 Since we didn't go to our honeymoon after wedding (because we were involved in building our house), and it was our great wish to see Ireland and meet our dear friends in person: Heather and Robert Lamont (that we met only by e-mails) – this was a great opportunity for all that. Yet another great Work of God: with Heather and Robert we felt rare deep bound, like we were family. After that visit I was even more determent to bravely step into dog showing and breeding. At Christmas holidays Heather and Robert brought us another Cavalier – a black&tan girl "Funny" from Moorfields Cavaliers Kennel! Do I need to mention that that was the best Christmas present? My hubbie would comment now "Don't say that we have three Cavaliers, say that we're missing one!". True, we need fourth colour (ruby) to make this picture perfect. It seems that this love for Cavaliers I carry is very contagious and all my family got it! My great hope is that some day our daughter will follow these steps and continue our love and effort in Cavalier King Charles Spaniel breeding.